I love Cinnamon Rolls but hate to make them. The part I hate is working with yeast and the rising of the dough. 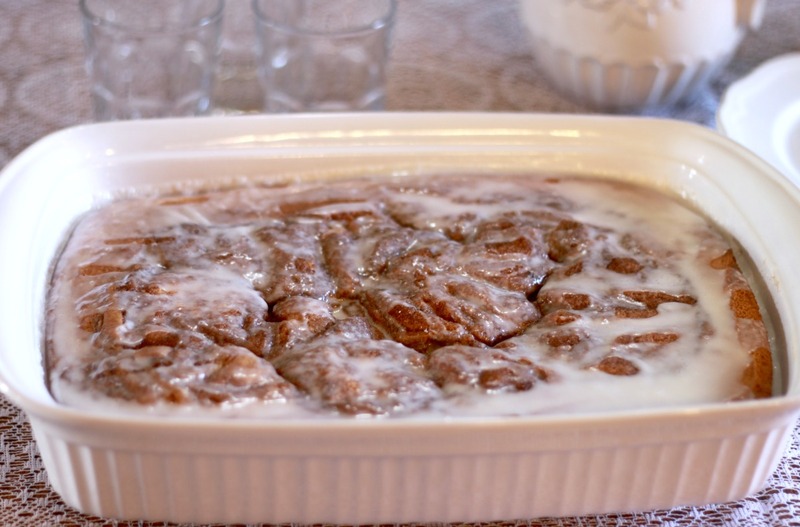 But it could be too I hate the time that it takes to make cinnamon rolls. Wait no more for the awesome taste of a cinnamon roll when you make this French Vanilla Cinnamon Roll Cake. We ate the cake pretty much right out of the oven. It was nice and warm and gooey just like a fresh cinnamon roll out of the oven. I like my cinnamon rolls warm and gooey. If I closed my eyes and you put a bite in my mouth I would have guessed I was eating a cinnamon roll. 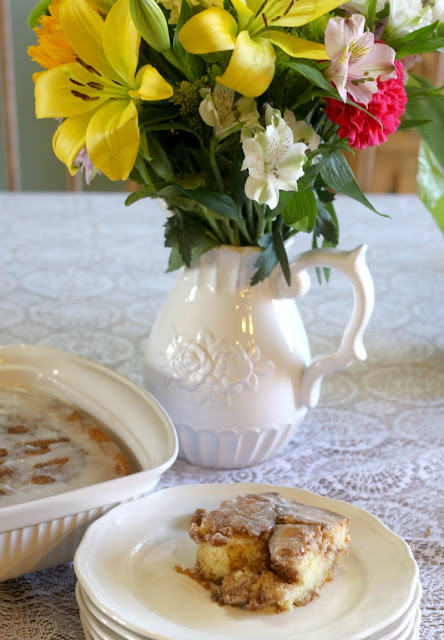 The icing did gather some on the top just like a cinnamon roll would but some did sink down into the cake and made it a sweet gooey cinnamony taste down inside. 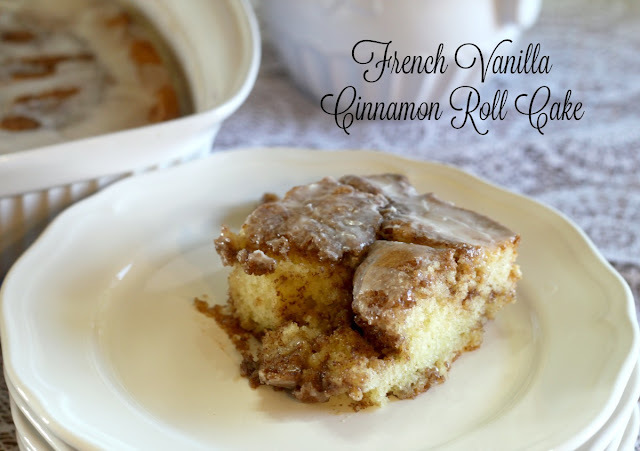 So if you are like me and love cinnamon rolls but do not like working with yeast or have the time to wait for your cinnamon rolls this French Vanilla Cinnamon Roll Cake a try. mix the cake ingredients in a large bowl with mixer until well combined. Melt the butter in the microwave and then add the topping ingredients to the butter stirring until all are combined. 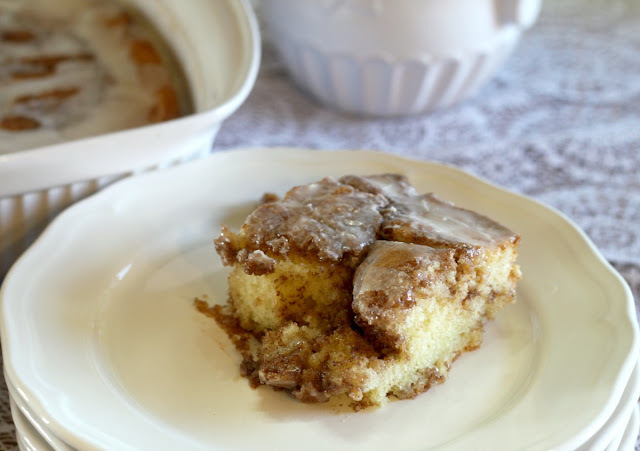 Pour the melted cinnamon topping over top of the cake. With a knife swirl the cinnamon mixture down into the cake. Bake cake in a 350 degree oven for 30 to 40 minutes. 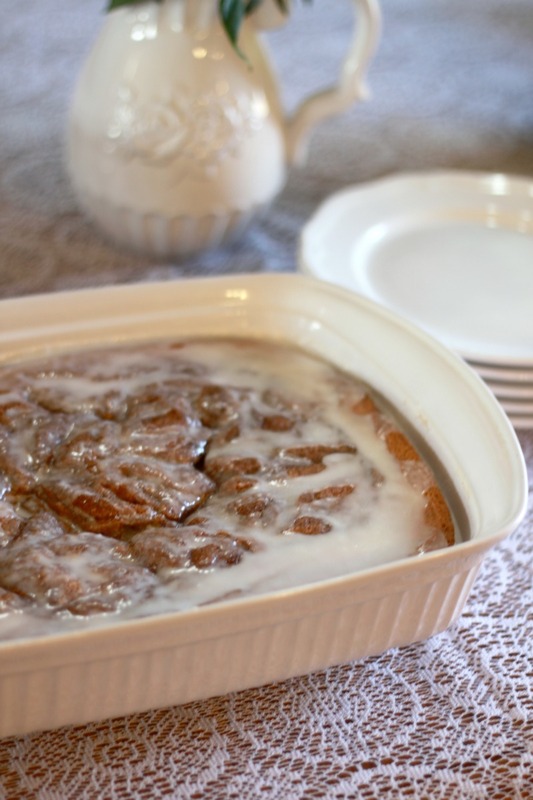 Mix icing ingredients until well combined and pour over the warm cinnamon roll cake. If you need too with a spatula spread the icing around to make sure the whole top of the cake is covered with this ooey gooey yummy icing... enjoy! How the heck do you print out the recipe??? ?